HCM City (VNA) — Water pumping stations in the Cuu Long (Mekong) Delta provide more than 985,000 cubic metres daily to urban areas, meeting 89 percent of the need, the Ministry of Construction has said. Of this, around 650,000 cu.m come from the Tien and Hau rivers and the rest from groundwater sources, according to the ministry. The provinces that depend much on groundwater are Long An, Tra Vinh, Soc Trang, Bac Lieu, and Ca Mau. The infiltration of seawater into rivers has affected the delta’s water supply, resulting in many pumping stations supplying water with salinity levels exceeding the norm by 0.06 – 0.12 percent. 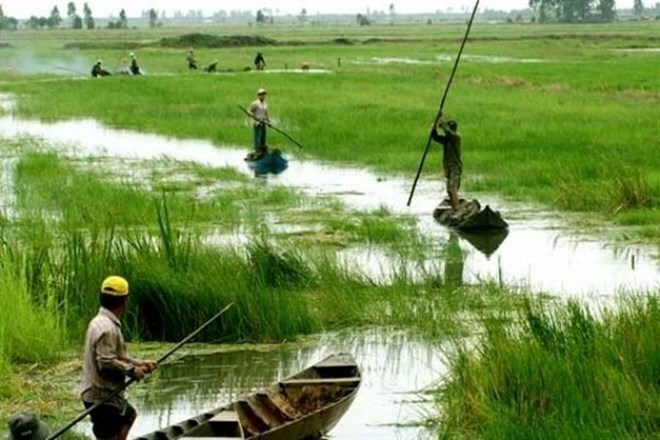 With the delta expected to require around 1.9 million cu.m daily by 2020, the Ministry of Construction has directed utilities in the delta to take measures to protect water sources. Following this, Kien Giang province plans to immediately build nine groundwater extraction facilities that will include 20 wells and enlarge the Rach Gia city reservoir’s supply capacity to 1 million cu.m a day. Ben Tre province will mobilise vehicles to transport water to homes and public facilities and speed up construction of a pumping station for untreated water with a daily capacity of 47,000 cu.m. In the long term, the ministry will work with relevant agencies to seek foreign investment for the construction of waterworks in the delta which use advanced technologies, adapt to climate change and are environmentally friendly. Five giant intra-regional water treatment plants - Tien River No 1 in Tien Giang province, Tien River No 2 in Vinh Long province, Hau River No 1 in Hau Giang province, Hau River No 2 and 3 in An Giang province - with a combined capacity of 1 million cu.m a day will be built by 2025. By 2030, their capacity will be increased by 650,000 cu.m a day. By then the delta, which has a population of more than 17 million, hopes to provide 98-100 percent of people living in urban with access to clean water.